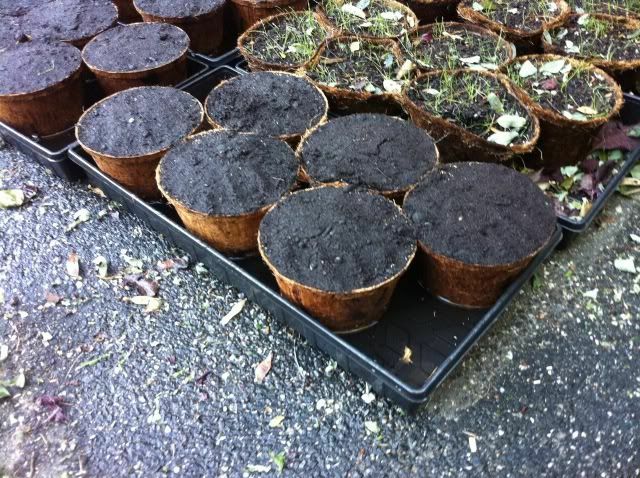 One of the fundamental problems with KBG is how long it takes for the seeds to germinate. 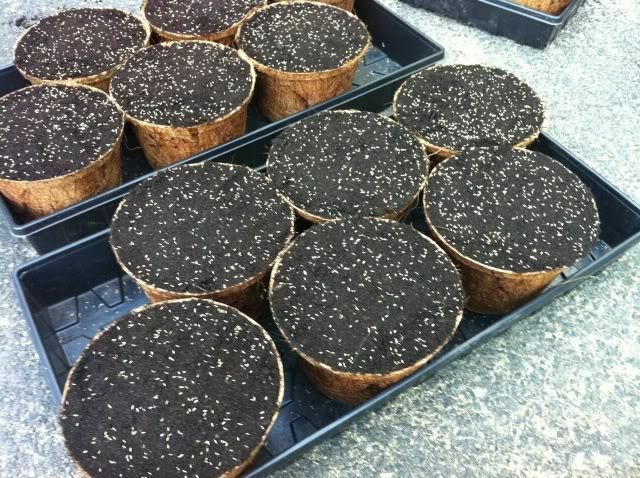 While some of the seeds, under ideal conditions, can germinate in 5 to 8 days, 14 to 21 is more common. As such, it is very difficult to overseed bare areas in an existing lawn as the irrigation requirements for germinating seeds are the opposite of existing grass (deep and infrequent vs. light and often). An additional problem is that you can’t use a pre-emergent on existing turf if you want to seed into it. 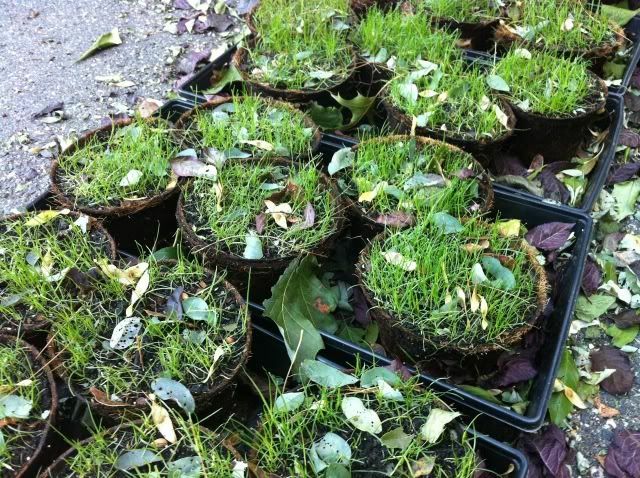 Planting pots of sod is a great solution for creating patches of existing sod that you can plant into your lawn to repair damaged areas or those that had poor germination at the time of seeding. If you are renovating, having 20 or 30 six inch KBG pots is a great insurance policy for the inevitable wash-out or animal damage. 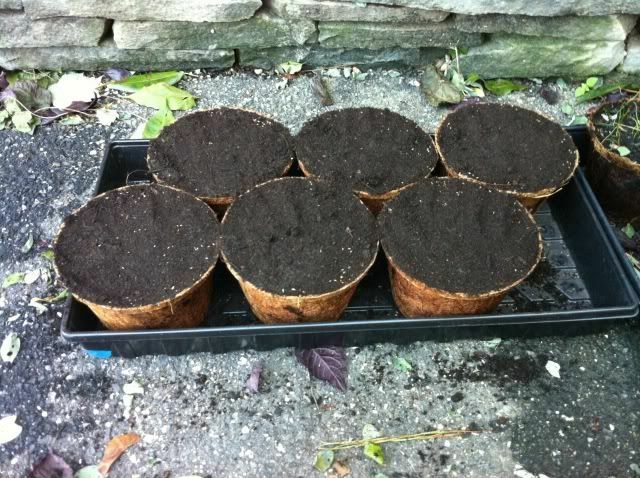 The best way to grow the sod is to plant 4-6 inch pots (larger is better) and place them into a tray so you can bottom water. The pots are usually ready to transplant in approximately 6 weeks, they tend to have great roots as the water is coming from the bottom. I prefer the coconut organic pots; purchase the best quality topsoil you can find and fill the pots to the top and lightly compress. Eventually these will be placed into your lawn. 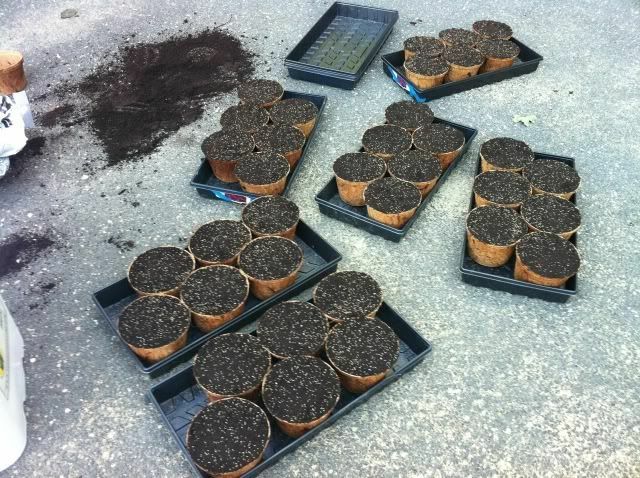 Here is a photo of a number of trays that have been seeded. It is important not to seed at too high a rate, the photo below is probably a bit too heavy. After the topsoil I water with the hose at a “mist” setting to get the top layer moist, then fill the tray with about an inch of water. A few hours later the inch is usually gone, at that point I add another inch. From then on, unless the weather is unusually warm, I water them from the bottom once a day for a few weeks and occasionally mist the top. As you move to a real piece of sod you can stretch the watering out to 2-3 days, but continue to do it from the bottom to get the roots to grow deep. Here is a picture after the initial watering (next to some 3 week old pots). I usually apply starter at about 2 weeks when the sprouts are showing, and then again in about 2 more weeks. If I’m fertilizing with Soy Bean Mean or Milorganite I might sprinkle some on the pots. When the pots are looking uniform (usually in 6 weeks), I transplant them into the lawn. 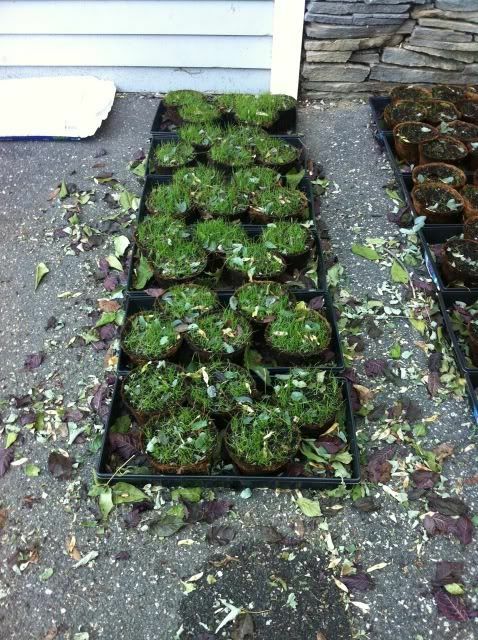 I always remove the pot, if not the sod will spread extremely slowly as the pots can take 1-2 years to break down. In a well fed lawn pots like those shown in these pictures that are planted in November should be twice as large (i.e, 12 inches) by the following June. 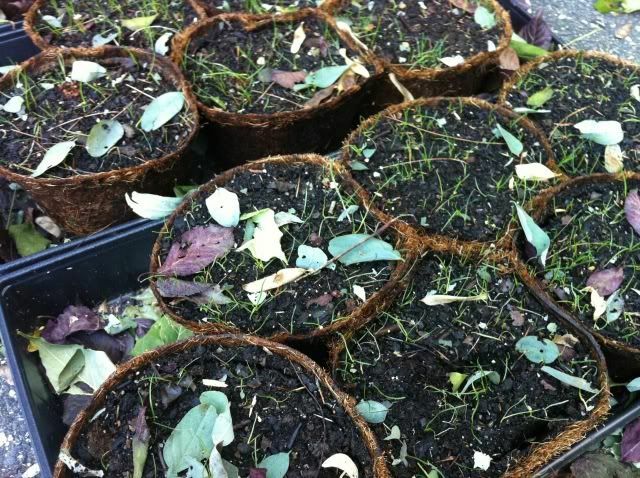 Here are pots after 5 weeks, they have been cut twice with grass shears.